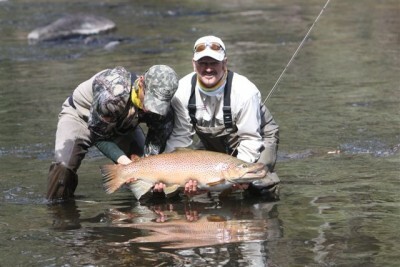 I can now reveal that during my recent trip down-under to Tasmania, I caught my biggest ever wild brown trout. Chris Bassano, my good friend and ex-Derbyshire cricketer, was my guide on the Lower Derwent River. We both saw the fish move before casting to it, but neither of us realised just how big it was! Closer to 30lbs than 20lbs was our considered estimate, but we did not have scales and we also wanted to release it, so in truth, we will never know. However, I have caught scores of 20lb plus pike and plenty of 20lb plus lakers from Northern Canada, so I have a pretty good idea about estimating weights. Chris too is expert on estimating brown trout, having weighed a 28lb brownie for one of his clients in the previous week - and that was from another river! If you want to read more about this amazing fish and see more pictures of my trip to Tasmania, then get this month's Trout Fisherman Magazine as they have the exclusive story. Take a look at the picture below and see what you think. In my last blog I reported on how difficult it has been to locate the pike on Chew this season. Lots of things have conspired to make things tricky, but I finally landed a decent 17.08 cracker yesterday. Armed with my new-found confidence, I was looking forward to finding a few more today, only to be scuppered by 25mph winds and all boats on Chew cancelled! Tomorrow it looks like the winds will ease and the weekend looks good - so I'm hoping my clients and I have some decent fishing.